Are you looking for a non-player character for your next roleplaying encounter? Do you find yourself scrambling to fill background vacancies during a game? Are your campaigns in need of some creative inspiration? Look no further. NPC For Hire connects you with hundreds of qualified and highly intriguing NPCs for your fantasy role-playing games. NPC For Hire isn’t another random character generator, it is a story driven aide for GMs. 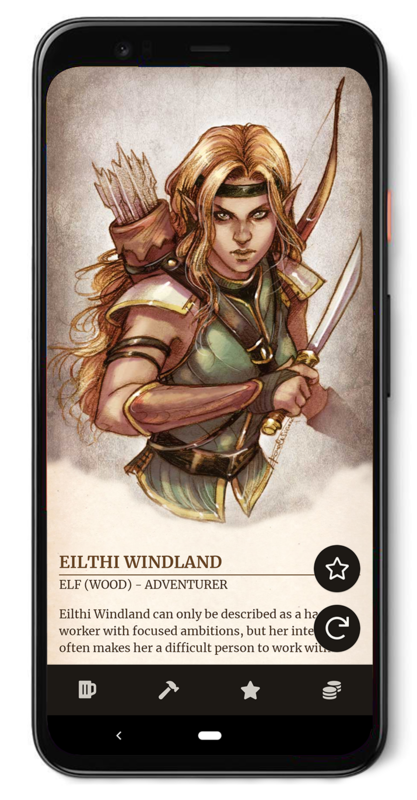 The app allows you to quickly create and save NPCs before and during your games. GMs will be able to spin up a story that is not only compelling but will immerse players in a fantasy world without extensive preparation. Each character has an attitude, unique bio, and interesting feats and flaws. The bios give a brief description of the NPCs background and alignment. Feats and flaws help GMs quickly come up with storytelling points and direction on how best the character can be played. Items are also generated for each character so the pickpocket of the group always has an opportunity to find something interesting.